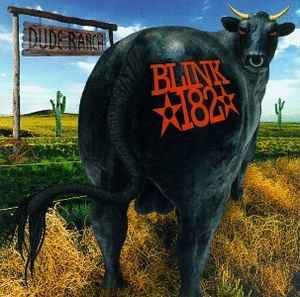 Dude Ranch is the second studio album by American punk band Blink-182. Recorded at Big Fish Studios in Encinitas, California with producer Mark Trombino, the album was first released on June 17, 1997 in the United States on independent label Cargo Music. The album was released on CD, vinyl, and cassette in 1997 after a special promo CD was released. The majority of these were split between MCA and Cargo. In 2009–2010, there were many vinyl pressings of Dude Ranch. The first of these was an orange translucent version released at Hot Topic; the numerous others were by independent label Mightier Than Sword. Isn't this edition similiar to the HotTopic repress from 2014? Either the picture is wrong or HotTopic did a 100% identical looking repress. Does anyone know? Yep, great sounding pressing, as with the other SRC reissues I have. Still, I would have gone with orange or light blue for this pressing - I don't understand why they would make it red, especially since their Enema of the State reissue is available on that colour, and it fits that album's colour scheme. This is odd. Why would they release a test pressing this late? Interesting that perhaps the first LP I ever bought, on a whim from Hot Topic, was actually a relatively limited release and is now my second-highest valued record. Good stuff. Blink 182: Tom DeLonge (guitar, vocals); Mark Hopper (bass, vocals); Scott Raynor (drums).Additional personnel: Mark Trombino (piano, keyboards); Scott Russo.Recorded at Big Fish Studios, Encinitas, California.Following the release of their 1996 debut CHESHIRE CAT, Blink 182 returns with a satisfactory sophomore effort. Clearly influenced by the likes of Green Day and Weezer, Blink 182 provides fast, aggressive punk that is also melodic and fun. The trio's lyrics are filled with the angst and alienation that teens can relate to, while injecting humor also. "A New Hope" is an ode to Princess Leia and the Star Wars gang, while "Waggy" is a word bassist Mark Hoppus came up with while belching. Hard-core fans of the band will not be disappointed, as "Degenerate" is a re-recording from their demo tape, and "Lemmings" is from a split 7". All the songs on the record are catchy and infectious and hit single potential abounds. The musicianship is also there, as the chops are tight and worthy of comparison to any great punk band. Overall, DUDE RANCH proves the continued viability of punk-pop in the late '90s. I just compared the black deluxe with this and there is virtually no difference, but i have to admit that this one has more surface noise, i guess virgin vinyl is just miles better to press. Still the greatest hits songs that appear in this are miles and leaps ahead, if you get the chance, compare them, thank me later. can anyone check if on their copy around when the solo of a new hope is playing the volume drops a notch and then comes back a few seconds later. Quiet, flat pressing....destroys all those Hot Toppic re issues. If you want decent sound?....get one of these. If you want something pretty to hang on a wall? Get the hot toppic pressings.